As i'm continuously trying to switch up my content, I thought it would be fun to incorporate areas of my life that I don't generally share much on this little space of the internet, and one thing that I get a lot of enjoyment and motivation out of is music. I thought it would be fun to share a few of my favourite playlist's on Spotify to introduce you to some new artists, and some new listening material for when you're next working out or taking a long drive. For those who aren't familar with Spotify, it is essentially a music service that you pay for to listen to hours of endless music from your favourite artists an pretty much any tablet, mobile or computer device. For me personally Spotify is one of my most used apps and with it offering student discount it's a no brainer for me to pay £4.99 a month when I get as much use out of it as I do. Since I began starting using Spotify I have always turned to the playlists that they generate based on all different genres of music, as it's the easiest way to see what new songs are being released or being are getting a lot of play time, and in turn I have discovered so many artists that I probably wouldn't of if it weren't for Spotify. So here a few of my current favourite playkists, of which I may update as and when I discover any new ones. Workout playlists - Since getting back into the gym i've been turning to their workout section which has a big variety of playlists depending the type of music you like, the type of exercise you're doing and even the type of motivation you are wanting. A favourite of mine has got to be Rap Workout, which is essentially a mixture of rnb and rap as that is my favourite genre of music but they have some songs with a good beat to really push you during your workouts. I also have been listening to Beast Mode when i'm really wanting to push myself during a good cardio session as it's good to really motivate you when your lagging. If like me you live a good bit of music to motivate you then I'd definitely recommend checking out their workout playlists as they are bound to have one or two that suit your taste. RnB playlists - As I mentioned I love anything rnb, and if you're like me then you'll no doubt love This Is How We Do which has a mixture of hip hop, rnb and rap from well known artists to upcoming artists and is my most listened to playlist. If you're more of a rap and grime listener then Rap Caviar is another favourite of mine, especially as I love a bit of Drake, Future and Kendrick Lamar. I personally enjoy listening to these playlists when i'm taking a long drive as I can give them a good listen, and they help to pass the time. Again they have a massive range of playlists within both the rnb and hiphop section to choose from. 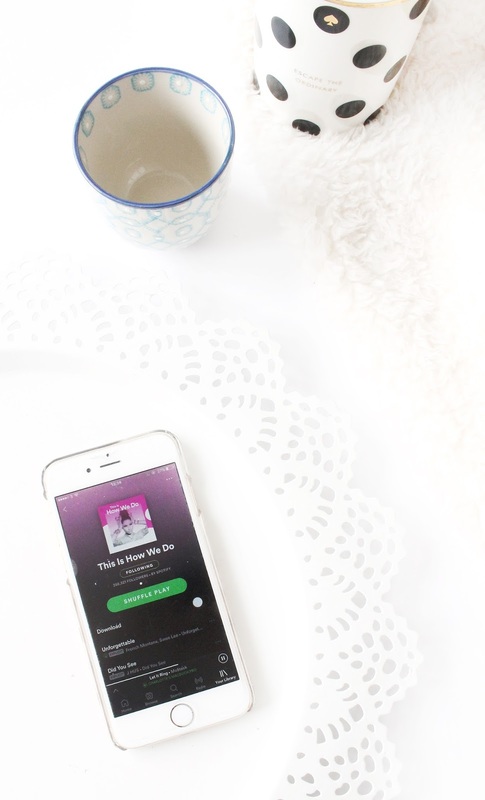 Easy listening - Whilst i'm at work, or when i'm having a good tidy session I like to have a bit of background music that's easy to listen to but isn't too distracting as I tend to listen to music to motivate me when i've got a big to do list to complete. A firm favourite of I think most Spotify users is the UK Top 50 Chart, which is pretty self explanatory but it has a good variety of different genres and really helps to pass the time. Lastly a playlist that I always give a listen to is the Discover Weekly, which is actually tailored to you based on artists you listen to, and each week Spotify pull together a bunch of songs they think you will like. It can be a bit hit and miss, but i've discovered some really good artists and one off songs thanks to that playlist. What playlists do you like to listen to on Spotify?